Composed in the time between the Third and the weighty Fifth, the Fourth Symphony, with its classical form, is like a haven of tranquility between the contrasting emotions of her two disparate sister works. Drawn along by the romantic expressiveness of the weightless opening which feels its way towards safety as it were, the music of the first movement soars upwards to sanguine elation. In true tradition of the genre, the second movement is simply entitled Adagio. Here the rich and melodic music is reduced down to a diminished ensemble with chamber-music-like transparency. Full of good humour and buoyancy, the effervescent Finale storms ahead via short contemplative passages and surges upwards to new heights of orchestral fury. 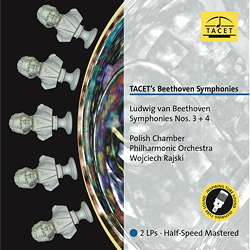 Wojciech Raisky, who always demands a highly cultivated sound and finely balanced phrasing from his orchestra, delves into the depths of the score to create a cheerful, contemplative yet very impressive interpretation, which reveals - even after several listenings - a wealth of previously unheard details.